The addition of local currencies simplifies the loan process for borrowers, allowing them to match the loan with their income. Investors also benefit from having loans denominated in other currencies, allowing them to diversify their investments globally. For example, investors can offset losses from local economic crises by funding loans in foreign currencies. Investors are also able to reduce the beta of their portfolios, adjusting portfolio volatility against local economic crises. 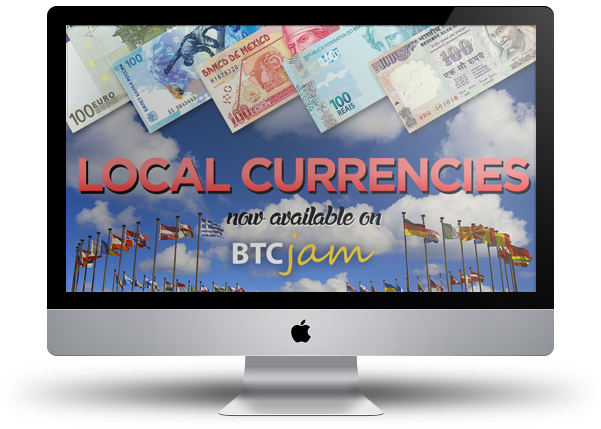 Funding your loan in your local currency makes borrowing on BTCJam easier than ever before. It is important to mention that investors must understand that they are exposed to exchange rate fluctuations versus their own currency. Meaning that if the borrower’s currency devalues, that devaluing may negatively impact the loan’s return. Of course, the opposite is also true: if the foreign currency gains value against the investor’s local currency, then the loan would get an exceptional return. We’ve been working on this for a while now, and we’re excited to bring you the option of using these currencies on BTCJam. As you know, our team is always working on new ways to improve our user experience. Do you have an idea on how BTCJam can get better? Send it to us at support@btcjam.com! Please make the possibility to link to gold price. I’d use this feature. Are you planning to add anymore currencies soon? What are your thoughts on adding currencies of country where bitcoin is already prevalent, like Canada, Argentina, Australia, England, Israel? Also what are your thoughts on adding currencies of countries where micro-lending is more useful and access to credit more difficult, ie Indonesia, Thailand, Philippines, Malaysia? Also didn’t Russia ban BTC recently? I think multi-currency system is not so important as verification system, verification should be MUCH MORE STRONGER. First of all video calls should be used. Probably 10-15 more options to verify yourself. Fot now btcjam is not much comfortable for investors, but it’s very comfortable for scammers. To run off with stolen money should be unprofitable, unbelievable, incredible. After that you can add as many currencies and states as you want and any other cosmetic features of your choice. Also will lending in certain currencies automatically result in different suggested interest rates and credit scores? Ie the RUB is much more unstable when compare to the USD and there is a large difference between the Russian cash rate (currently 15%) and the Fed Funds rate (currently 0%).